The map above was designed to help you plan a trip to England. It shows many of the most popular towns, regions, and World Heritage sites to visit. The attractions shown on the map are further explained below. Most overseas visitors to England are going to start out in London, so that's our datum point for distances. 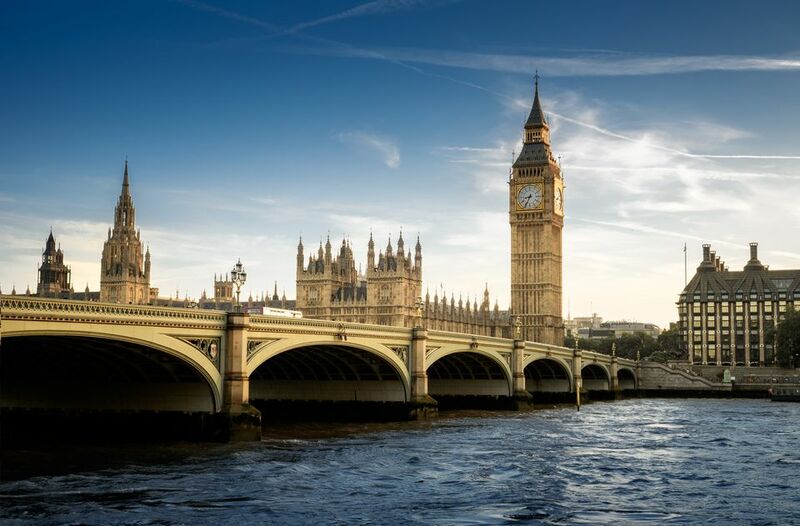 You can easily spend a week in London without worries about running out of things to do. Canterbury is the Spiritual center of England, located 53 miles from London. The famous Canterbury Cathedral is an important place of pilgrimage in itself, but its also the start of the Via Francigena, a pilgrimage route from Canterbury to Rome first documented by Bishop Sigeric of Canterbury in 990. Brighton is famous not only for its "hip, urban beach", but for its Royal Pavilion, which our guide to the UK calls "Britain's Most Exotic and Extraordinary Palace". Windsor Castle, one of the Monarch's principal official residences, is also one of Britain's most iconic landmarks. It's not far from Heathrow Airport and arriving passengers - even if they have never been to Britain before - can usually recognize it from the air. Stonehenge, When you think of old England, I mean very old England, you think of Stonehenge. Made a UNESCO World Heritage Site in 1980, it's now roped off unless you make special arrangements, which are explained in the article linked below. How to get to Stonehenge: It's an hour and a half drive to get to Stonehenge from London. Here is a route map with prices and times for driving, bus, or train access: London to Stonehenge. Bath is another interesting destination and UNESCO World Heritage Site on every "Best of England" list. Bath is Britain's only natural hot spring, and people have been using the waters here for over 2000 years. St Ives Cornwall is on Ferne Arfin's list of the Top UK sites as an artist's colony, "St. Ives is the area's premier artists colony with fishermen's cottages, steep cobbled lanes, crafts shops, and Britain's mildest climate...Typically for an artists community, there are also very good restaurants and charming hotels -- not to mention the palm shaded beaches." The Cotswolds is composed of a range of hills of outstanding beauty. Villages in the Cotswolds include homes largely made of the local limestone, contributing to the "quaintness" of the scene. Walkers can walk the Cotswold Way along a 102-mile footpath. Stratford-upon-Avon is well known as the birthplace of William Shakespeare; John Shakespeare, his father, and a glove maker had a substantial house in the center of Stratford-upon-Avon. Take a pilgrimage to the bard's hometown and take in a play or two. The Iron Bridge that spans Ironbridge Gorge is an iconic monument that seems to have set in motion the industrial revolution. "Today there are 10 museums on 80 acres at the Iron Bridge Gorge UNESCO World Heritage Site. The award-winning museums range from China and tile makers to an entire, recreated Victorian town." The English Lake District is a vast national park in the north of England. There are over 50 lakes carved out by glaciers in the Lake District. Hadrians Wall, The Roman's defensive wall at the northern edge of the Roman Empire, can be followed for 73 miles. But it's not just an endless wall, you visit villages and museums documenting England's Roman past. Durham Castle and Cathedral make up a World Heritage Site: "...the site's role as a political statement of Norman power imposed upon a subjugate nation, as one of the country's most powerful symbols of the Norman Conquest of Britain..." The Castle is now part of University College at Durham, and you can even stay there! York has a rich heritage starting with the Romans in 71 AD who called it Eboracum. It's position between capitals London and Edinburgh made it important in the past and a likely stopping off point for tourists visiting the UK. York is only two hours by train from London, driving distance is 210 miles. Would you want to stay someplace you can write home about? How about doing a little Champing? It's a way of saving country churches, you camp in a church for a small sum. There are lots to do around these churches, which the association will clue you in on. Have fun exploring England!